Your tableware speaks volumes about your restaurant. An injection of unusual tableware can add drama and class to an establishment. Restaurant cutlery with the right weight, design and flair can change the way food is perceived. Competition is always hot in the hospitality trade, so it’s never been more important to stand out from the crowd. An appealing tableware offering goes a long way to winning over diners. 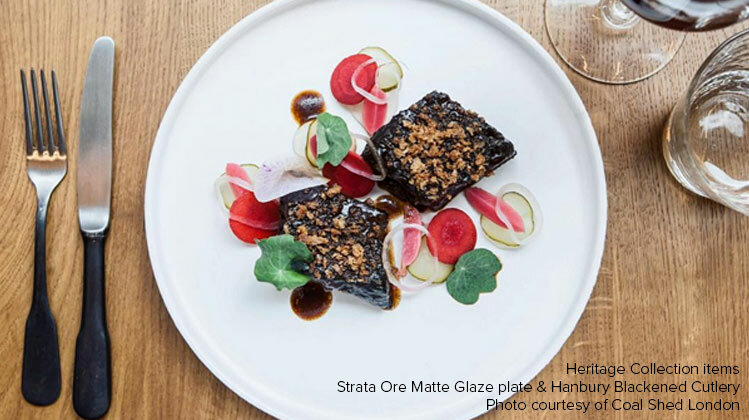 Heritage work closely with chefs, restaurant managers and hoteliers to identify trends and offer innovative methods of implementing a tableware range that is attractive, as well as cost-effective. One important aspect of getting your tableware offering spot-on is stylish cutlery. Our restaurant cutlery collections are moving beyond the traditional silver spoon. The latest gorgeous flatware innovation from Heritage Collection is Black matt cutlery. Silhouetted against a stylish tabletop, our new black cutlery range offers clean, contemporary design, the ultimate in chic contrast.